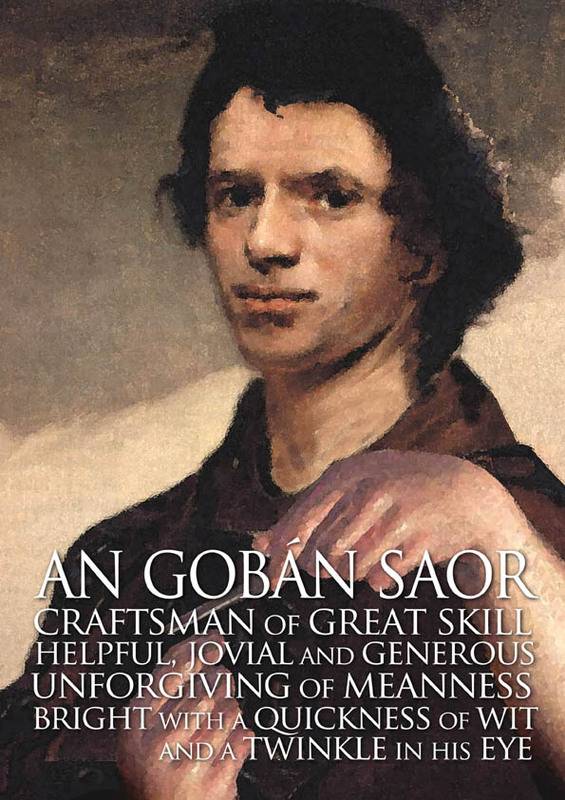 The Gobán Saor was a famous craftsman of Irish legend, being a rather more homely version of the smith god Giobhnú. He was as famous for his quick witted responses as he was for his great skill. He had no airs or graces about himself, always creating objects of beauty and craftsmanship, no matter how little the person was able to pay him for the work, but he hated any sign of meanness. Many of the stories of the Gobán are about outwitting people who try to cheat him out of a fair payment. As a craftsman he had such skill, finesse, deftness and accuracy that he could hammer a nail into a high beam by tossing both nail and hammer into the air. He could fashion a throwing spear while you counted to five, and shape a spearhead with three strokes of a hammer. While building a monastery for a group of monks the monks demanded that he lower his price. To force him to agree they removed the ladder from the tower he was working on, trapping him. The Gobán started to remove stones from the structure and toss them on the ground, jovially saying that it was as good a way to reach the ground as any. The monks swiftly returned the ladder, and paid him in full. The Gobán and his son built a fort of a foreign king that was of such exquisite quality that the king grew jealous. He decided to kill them so that his fort would go unrivalled. One look at the king, and the Gobán sussed out his intention. He told the king that he could not complete the work without his “crooked and more crooked”, a tool he had left at home. Unwilling to let them go, the King sent his son to fetch it, not realising that the name of this implement was actually a coded message for Gobán’s wife. She held the king’s son, and ransomed him for her own husband and son. On their way home they came across a group of carpenters who were desperately trying to figure out how to build a bridge without pegs, dowels or nails, as had been demanded by their king. “Sure let’s see if we can figure out a way to help” the Gobán said to them, and proceeded to build a sturdy bridge, cleverly using its own weight as a means of holding it together, so it became stronger the more weight was put on it. The carpenters were impressed, but grumbled a bit that he was more able than they at their own trade. They stopped at a house where there lived two sisters. The Gobán advised them to keep the head of an old lady by the hob, to warm themselves with their work in the morning, and to take a sheepskin to the market and come home with the skin and its worth. One of them dug up a skull, then burnt her carded wool to keep herself warm, then made a fool of herself by asking for the price of the sheepskin without handing it over. The other sister fetched in an old, destitute lady to sit by her fire, wormed herself by her industriousness, and sold the wool from the sheepskin, while keeping the skin. The Gobán, impressed by her wit, asked her to marry his son. Helpful, jovial and always generous. The trait the Gobán finds hardest to forgive is meanness, and the trait he likes best is to see the same quickness of wit he has himself. This smartness gives him an air of brightness and an irrepressible twinkle in his eye.